JIRA is the tracker for teams planning and building great products. Thousands of teams choose JIRA to capture and organize issues, assign work, and follow team activity. 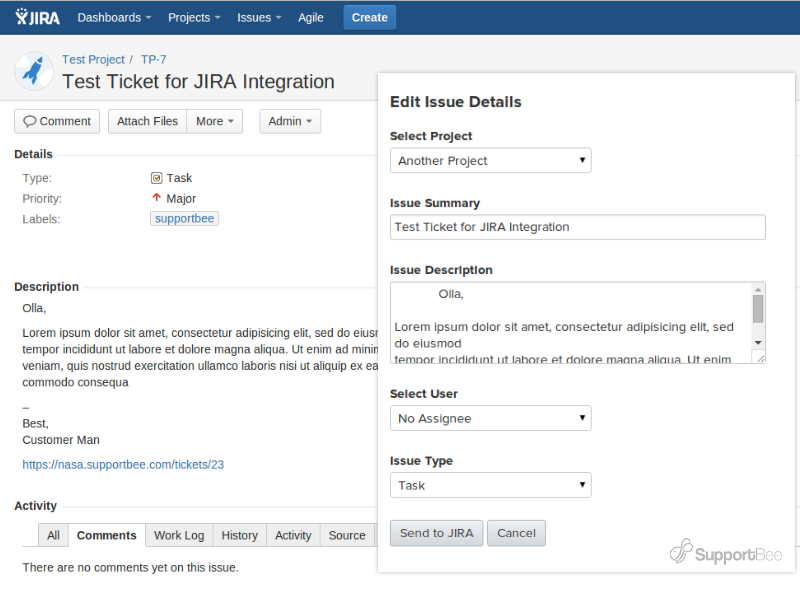 The JIRA integration can send your customer support tickets to JIRA and create issues. If the support tickets need some development work done, directly create an Issue and send it to JIRA without leaving SupportBee. You can send tickets to multiple projects in JIRA. Select Integrations > Send to JIRA, and all your projects would be populated in a dropdown. Once you select a project, you'll see that the 'Select User' dropdown is populated with all the assignable Users. You can assign the Issue to a User before sending the ticket to JIRA. By default, the issue would not be assigned. You can also a select an Issue Type before creating it. You would see the Issue Type dropdown populated with all the available Issue Types. By default, it would be set to Task. We now support both JIRA OnDemand, and JIRA Self Hosted. The only thing you need to make sure is that your JIRA instance is accessible via HTTP or HTTPS. To add the integration, click on 'Add to My SupportBee'. If this is the first integration that you are adding, you will have to enter your subdomain and you will be taken to a settings screen. Fill in the following details. This would be the Username and Password of your JIRA instance. It would be best if you use the Global Administrator's crendentials to configure the integration, as then you would have access to all features, including assigning Issues. For OnDemand users, the domain would look something like this: 'https://example.atlassian.net'. For Self Hosted JIRA, you should first make sure that your JIRA instance is accessible via HTTP or HTTPS, the domain could look something like this: 'https://example.com/jira' or 'http://your-machine:2990/jira'. To check that you are using the correct URL, visit it using your browser. You should be taken to your JIRA instance. Using the integration is fairly simple, open a ticket and click Integrations > Send to JIRA. You can edit the Title and Description of the Issue, and select the Project to which you want the Issue to be sent. You can also assign the Issue to a User, and give it a type. We also put a link to the ticket in the story description. Don't have a SupportBee account? Signup! Don't have a SupportBee account? Signup! Account not listed? You have to login first. Please re-login to your SupportBee if you last logged in over an hour back.